Here we’re gearing up for the baby’s first birthday which means thinking a LOT about the catering for his afternoon tea party. As the baby will be unaware of the significance of the event, and most likely a bit annoyed that strange people have turned up in numbers to interrupt his afternoon play, the party is all about what I like to eat. That’s why it’s afternoon tea. One of my relatives is a coeliac (or celiac, if you’re American) and I actually find it rather fun to try out recipes that she’ll be able to eat. It’s actually surprising how easy gluten is to work around. However, one thing I haven’t investigated too much is gluten free baking – dessert wise there’s loads of things you can do without gluten so I’ve just never bothered. I have hundreds of baking recipes tagged in delicious and I thought it was time I made a departure from what has become my standard caramel chocolate brownie. I had a recipe from the Gluten Free Goddess tagged, but realised it wouldn’t do on several counts (the coconut oil, the measurements in cups, the huge amount of vanilla). Karina had based her version on a reader’s version and, after some sums, some substitution and some tasting during production I came up with this very easy, but also very tasty, recipe. 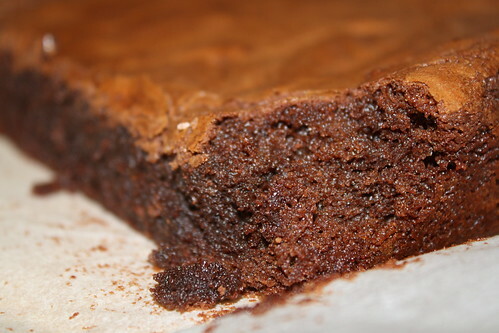 The finished brownie is super squidgy in the middle and has a crisp crust which manages at the same time to be chewy. The best compliment came from Andy who commented “well, you wouldn’t even know they’re gluten free”. Preheat your oven to 180°C (or 160°C fan). Melt 150g dark chocolate with 100g of unsalted butter. If you are aiming for dairy free as well as gluten free, I suppose you substitute a dairy free spread here. And, as always, I did this in the microwave. Beat all of this with 2 eggs before adding the melted butter and chocolate. Pour the mixture into a baking dish lined with baking paper. I used a dish that is approximately 18cm x 27cm and I ended up with nice thick dense brownies. Bake for about half an hour. On non fan my oven is a little slow, so I needed 40 minutes. The top will be firm and cracked and a toothpick should come out cleanly (or mostly cleanly – with brownies you don’t want to overcook them!). Allow to cool before cutting (and eating). If you’re particularly greedy, serve with cream. That’s what we did! * In Australia this is widely available – you’ll find it in the baking aisle of most supermarkets. Just note that you want rice FLOUR and not GROUND rice – otherwise you’ll end up with gritty brownies!